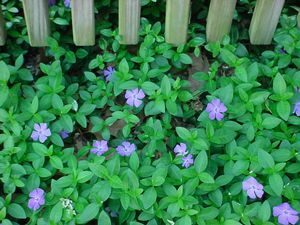 Phlox-like blue-violet flowers light up against the 1 ½” long glossy green leaves in early spring. The 18” evergreen trailing stems reach a height of 4-6” and will continue to bloom intermittently throughout the summer. Provide moist well-drained soil and more shade in warmer climates.